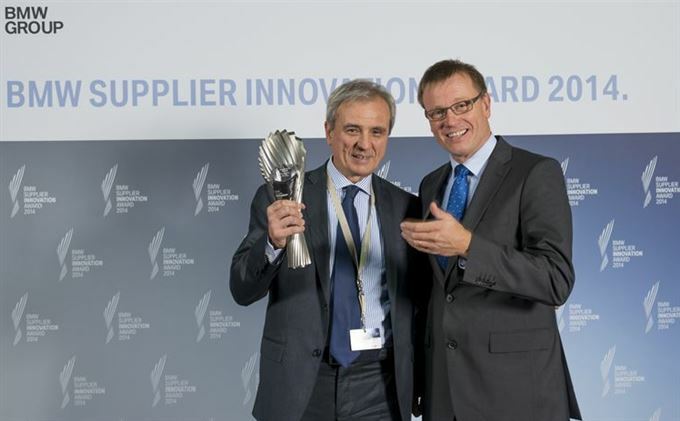 BMW has awarded Italian tyre maker, Pirelli, its 2014 BMW Supplier Innovation Award. The "best innovation in quality" prize was presented at a ceremony recently in Amsterdam, for Pirelli's Real Dynamic Curing technology, which is used in its tyre vulcanisation process. The technology allows the optimal degree of vulcanisation to be calculated for each tyre via the use of a thermal sensor. Vulcanisation, the process in which a tyre's characteristics are 'set' by heat, is the final phase in the tyre production process and a determining factor in the quality of the finished product. Pirelli is one of the key suppliers to BMW worldwide and produces made to measure run-flat tyres in close collaboration with BMW's engineers, specifically designed for each model. These tyres can be distinguished by a special star marking on the sidewall, which indicates that the tyres have been made especially.